It’s ‘Dog Biscuit Appreciation Day’ – Friday, 23rd February 2018. We’re taking this opportunity to launch our forthcoming range of organic dog biscuits – free to every dog coming into Arthur’s Farm Kitchen Café and baked in our farm kitchen. 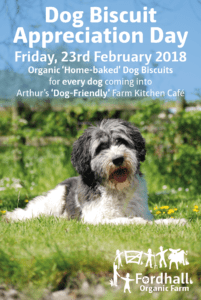 It’s also our chance to remind people that Arthur’s Farm Kitchen is a ‘dog-friendly’ Café – we love seeing owners bringing their muddy-pawed friends in with them. Tomorrow’s biscuit is beef heart, pumpkin and oatmeal. Nic promises to explore gluten free and vegetarian ingredients too.